Next Article Transfer Window Preview: Part 2 - Who Do We Need? 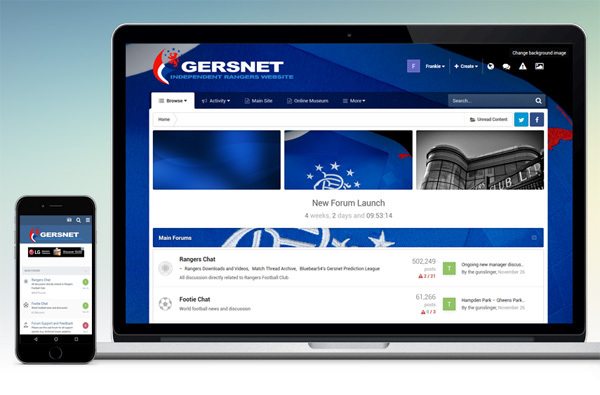 vBulletin has served us well over the last 10+ years but the time has come to move on as the Gersnet forums become increasingly popular. As such, as we notified to members in early December, later tonight (provisionally early on Friday 5th January) we will be commencing a move to the latest version of IPS Community. Unfortunately, as much as this is really positive news, it will mean the forums are closed for up to three days as our technical team migrate all our data over to the new software. However, IPBoard offers a lot of advantages compared to the existing software: it's faster, gives us improved functionality, reliable updates, flexible themes and increased security so it's well worth the short period of downtime. After a very busy month of competitive football for Rangers in December, the SPFL has now closed for its winter shutdown so with a couple of weeks to spare before our next competitive match against Fraserburgh in the Scottish Cup (notwithstanding the friendlies in Florida) it's the ideal time for us to move forward with this. Fingers crossed the real thing goes well over the next few days! In the meantime, please check out the FAQs below and we'll keep you all informed throughout the process via our main site and social media accounts. The move to our new software is going to schedule and we'll hopefully have more news on its availability later on Friday night/early Saturday morning. Q. Will Tapatalk worth with IPBoard? A. Yes, although the new themes are fully responsive (i.e. resize automatically across all devices) you'll still be able to use Tapatalk if you wish. A. The migration is expected to take anything up to 72 hours so we apologise for any inconvenience. Keep an eye on Twitter for updates. A. Yes and this will be released once the move is completed. You should update any bookmarks but old ones should work initially at least.